December, a most exciting month (in so many ways!). During the first week or so, comet Ison might be visible after its close encounter with the Sun. You’ll need to be up early though, as you will only be able to see it just before dawn at around 0630. If you can manage to open at least one eye at that time of the morning, find the Big Dipper, which at this time is standing on its handle. Follow the curve of the handle downwards to a bright, slightly orange star, Arcturus, and continue down to the eastern horizon. The comet will travel upwards, just to the left of this line, although getting fainter as the days go by. Whilst you are there, look high in the western sky to find the brightest object. This will be Jupiter, the largest of the planets. Now imagine a line from here to the Sunrise, in the southeast – this is the ecliptic. Following this line from Jupiter, we come to the brightest star in Leo, Regulus, then just below Leo’s tail is Mars, looking quite pink and not too bright just yet. Next is Spica, the brightest star in Virgo, and low in the glow of Sunrise is the planet Saturn. Then, for the first couple of days anyway, there is Mercury, very close to the horizon and probably tricky to spot. So there you go, four planets and all before breakfast! In the early evening, at about 4.15 – hang on! That’s still the afternoon! It gets dark while some people are having their afternoon nap! Anyway, at this time, Venus can be seen in the afternoon twilight, just to the west of south. Very bright and distinctive, look out for it especially on the 5th, when a thin crescent Moon will be close by. This occurs again on the 2nd of January but will be more of a challenge as it will be very close to the Sun. Towards the end of January, Mercury pops out from behind the Sun, to become visible in the glow of the Sunset. Later in the evening, we start to see the arrival of the astronomical signs of winter. Looking high in the south at about eight o’clock, you should easily spot the Pleiades as a misty patch containing bluish stars. To the left of these is Aldebaran, the red eye of Taurus, sitting in the “V” of the bull’s head. Left and lower down is the mighty constellation of Orion, with the giant red star, Betelgeuse at top left. Finally comes Sirius, the eye of Orion’s hunting dog, sitting at his feet. Watch this wonderful collection as it marches across the sky on a daily basis, chasing away the old year and bringing in the new. 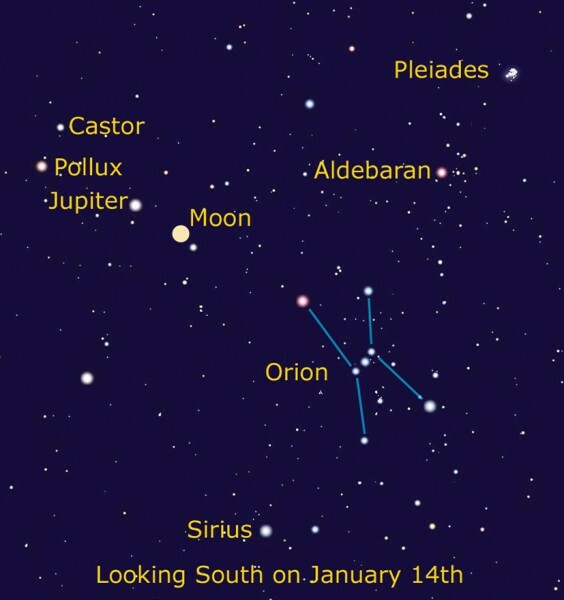 Look for them especially on January 14th, when a bright Moon arrives to form a line with Betelgeuse and Rigel in Orion below and Jupiter and Castor above. In the meantime, have a very planetary Christmas!